Seventeen-year-old Molly Ayer knows that a community service position helping an elderly woman clean out her home is the only thing keeping her out of juvenile hall. But as Molly helps Vivian sort through her keepsakes and possessions, she discovers that she and Vivian aren’t as different as they appear. A Penobscot Indian who has spent her youth in and out of foster homes, Molly is also an outsider being raised by strangers, and she, too, has unanswered questions about the past. Orphan Train tells the story of Vivian, an elderly woman living in Maine. As a young woman, she traveled to Minnesota on an orphan train. By chance she meets Molly, a young girl in foster care who comes to the house to help her sort through the attic. The attic is full of a lifetime of memories. As they sort through the boxes there, Vivian and Molly bond over their common experiences, many years apart. This is a unique novel. It is a historical novel, since much of the narrative happens in the 1920's - 1930's. However, there are also sections of the book that take place in the present day, sorting out the past. I loved the structure of the book. I found both Vivian and Molly sympathetic characters, and I really became engrossed in their stories. I especially was eager to read about Vivian's life. 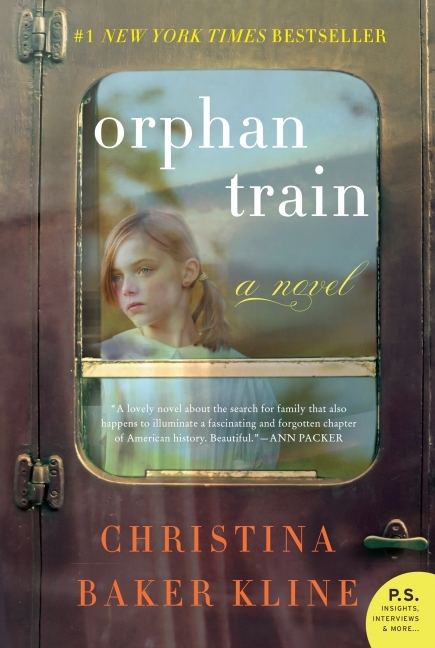 Orphan trains were new to me before this book, and the historical details were fascinating. "Vivian has returned to the idea that the people who matter in our lives stay with us, haunting our most ordinary moments They're with us in the grocery store, as we turn a corner, chat with a friend. They rise up through the pavement; we absorb them through our sole" (p. 117). Orphan Train, at heart, is a novel about love and connections between people, about how small incidents can change a life, how compassion can change people. I cannot say enough about what a lovely read this is. I started reading it on a Saturday night and stayed up into the wee hours reading because I could not put the book down. I felt I was living the story; it was that engrossing. 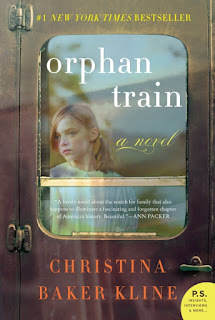 I am certain that Orphan Train will be one of my favorite reads this year. I recommend it very highly for fans of historical fiction, book group discussions, and anyone who loves a beautifully crafted story. Five stars! I received this book from HarperCollins and TLC Book Tours. The fact that orphan trains really are a part of our history just boggles my mind. It is fascinating and horrifying at the same time.